Once the booking form has been requested, the Reception of Camping Montagut will answer by mail as soon as possible. If the answer is positive you have 7 days to pay the 30% of the stay rate. It will be considered as payment in account for the invoice of the stay. The reservation gets formalised with the confirmation sent by Reception after receiving the 30% payment. 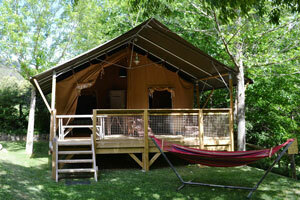 This payment can be done by bank transfer or Virtual POS on the web site of Camping Montagut. We consider the reservation cancelled when his holder does not turn up during the following 24 h. after the date contracted and does not communicate the reason of the delay. This fact imply the loss of the amount paid. the refund of 75% of payment done to reserve when it is done with 6 week or more advance, before the arrival date. the refund of 50% of payment done to reserve when it is done between 5 to 3 weeks advance, before the arrival date. there is no refund of reservation payment when it is done with 3 weeks or less advance, before the arrival date. The wood lodges cannot be reserved for groups nor celebrations or events. Camping Montagut reserves the right to annul the reservation, refuse the admission or to advance the check out of the lodge in the case this fact has not been communicated. 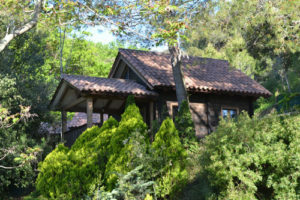 The wood lodge will be at your disposal from 16h and until 21h of the arrival day reserved; in case of a later arrival it must be communicated to Reception. The limit time to enter is 22:00h. Check out is maximum at 11h. of the leaving day contracted. It is understood that the check out is from the lodge and from the camp site installations. Tourist tax will be paid in the moment of registering: 0,50 € per person over 16 years old and for a maximum of 7 nights. The occupancy cannot exceed the 5 persons admitted in each wood lodge. It is not possible to put tents on the garden or on any plot of the camp site. Each lodge has his own parking and it is for one vehicle. If there is an extra vehicle it will be counted additionally, during H Season and H+ S., according to the price list of Camping Montagut. Reception will assign a place for this vehicle. No pets admitted on the wood lodges. When checking, 150 € will be withhold from your credit card (not debit card) as a deposit. Camping Montagut will invoice what necessary in case of flaw, loss or cleaning less. If the check out is before 9h. the refund of the deposit withhold will be done “a posteriori”. You cannot smoke inside the wood lodges. It is permitted in the porch or outside of the lodge. Please, be careful and do not throw the butts on the garden or on the nearby lands. Visitor is any person external to the reservation that wants to entry in the camp site. Visitors are not admitted in the wood lodges. Maximum speed of vehicle’s circulation in the camp site is 10 km/h. To respect the calm ambiance of the camp site is important. Therefore, please maintain the volume of voices of adults and children in a moderate level along the day. The same for the noise of electronic devices like TV, tablets, etc. We ask the clients of the lodges to respect the rest right and relax of the other customers. Night silence timetable is from 24 h. to 7 h.
In case of doubt originated in the offence of these rules, Direction of C. M. will always opt to preserve the acoustic calm that characterise the camp site and his natural environment. Please respect the installations, trees and plants of the camp site. Help us to preserve it and to maintain everything clean.